Timbuctoo Road crosses the Colusa Highway at the east end of the Yuba River Bridge (see Google Earth photo below). The road snakes back and forth northeast of the highway before recrossing it a mile to the east. Pony truss bridges carry the road over deep ravines that cross the road. Deep Ravine Bridge No. 1 (16C0010) is a 50 ft long Queen post truss bridge with timber and steel beam approach spans that was built in 1936. The approach span on the north (far) side was severely damaged a number of years ago and the bridge remains closed. A Queen post truss has vertical members at the 1/3 and 2/3 points along the span that act in tension to carry the deck. Deep Ravine Bridge No. 2 is somewhat longer, a 70 ft long Pratt truss with three vertical posts. This bridge was built in 1903 and remains in service (although with a sufficiency rating of only 21.8). Having Deep Ravine Bridge No. 2 remain open is clearly of some importance. 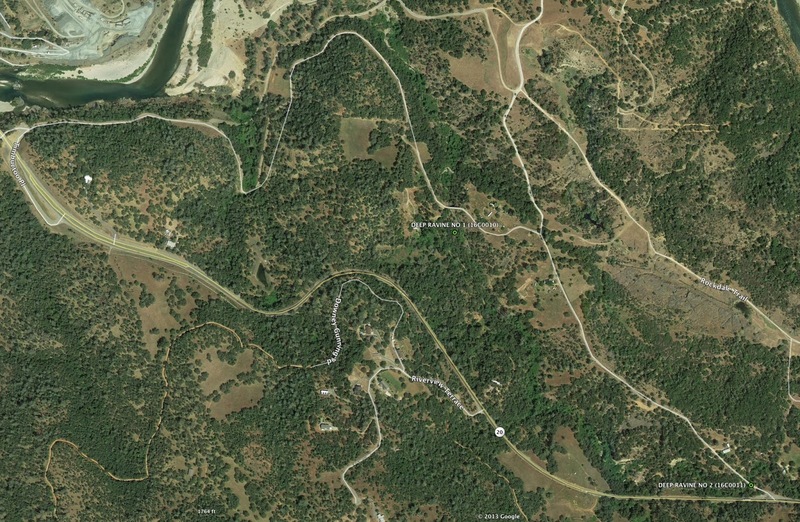 Since both ends of Timbuctoo Road are connected to the Colusa Highway, as long as one bridge remains open drivers can access both road segments. Maintenance crews do a good job of replacing the timber deck and making sure this 110 year old bridge remains in service. Yuba County, California Bridges: Timbuctoo Road Bridges across Deep Ravine #1 and #2 by Mark Yashinsky is licensed under a Creative Commons Attribution-NonCommercial-NoDerivs 3.0 Unported License.